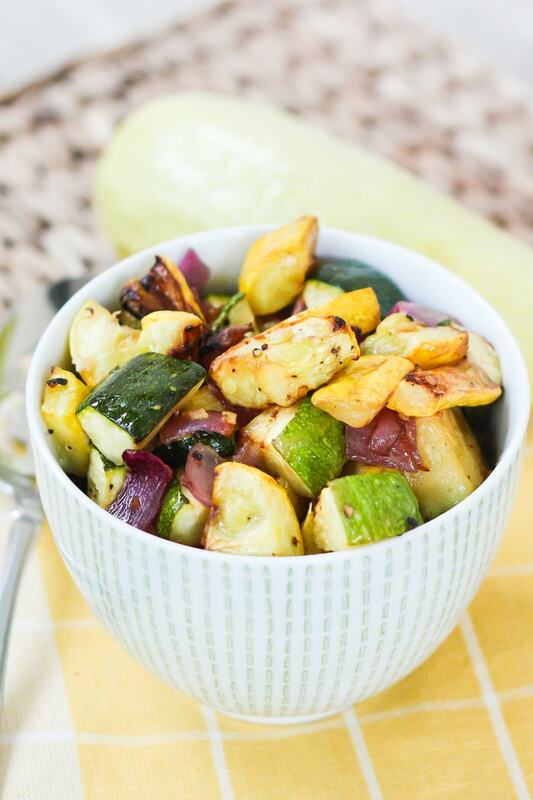 An easy summer side, this coconut oil roasted summer squash and zucchini recipe is healthy, easy and so flavorful. Vegan and gluten-free. Summer squash and zucchini scream summer to me. My Mom used to sauté them both in butter with onions at least once a week during the summer months and to this day I still love the combo. So when Isaac brought home a huge box full of summer squash, zucchini, tomatoes, cucumbers, corn and figs last night (Thank you Dan and Ellen! ), I decided I would try my hand at a similar preparation only this time the veggies would be roasted instead of sautéed. It worked out perfectly and the squash and zucchini came out warm, a little charred, sweet and amazing. I’m pretty sure I could eat the whole batch in one sitting. <– No surprise there as that happens with almost all roasted veggies here at Casa de EBF. 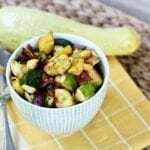 If you make this roasted summer squash and zucchini, please be sure to leave a comment and star rating below. Your feedback is super helpful for the EBF team and other readers who are thinking about making the recipe. 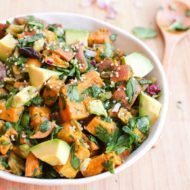 Place zucchini, squash, onion and garlic in a large bowl, drizzle with coconut oil and stir until all the veggies are coated. Sprinkle on salt and pepper and stir. Spread mixture out on a large rimmed baking sheet or baking stone and roast for 30 minutes, stirring once around the 15 minute mark. *If you don’t have coconut oil on hand you can use a different oil, however coconut oil makes roasted veggies soooo delicious. If you haven’t cooked with it before, I would highly recommend trying it. This is the perfect side dish to a protein of your choice. It’s pretty versatile and pairs well with almost anything. I’ll also note that it’s great in salads and wraps as well. I purposefully saved some from last night’s batch so that I can put it in salads and wraps this week for lunch. I hope you are having a lovely week thus far. Mine has been pretty good, which leads me to the fact that I have some fun news to share later this week. I’m super excited about it, but can’t let the cat out of the bag just yet. This looks super healthy and yummy! This is perfect! I have tons of summer squash and zucchini and was going to google a good recipe but you saved me a step. Can’t wait to try this- looks delicious! Looks awesome!! Isn’t summer squash the best? 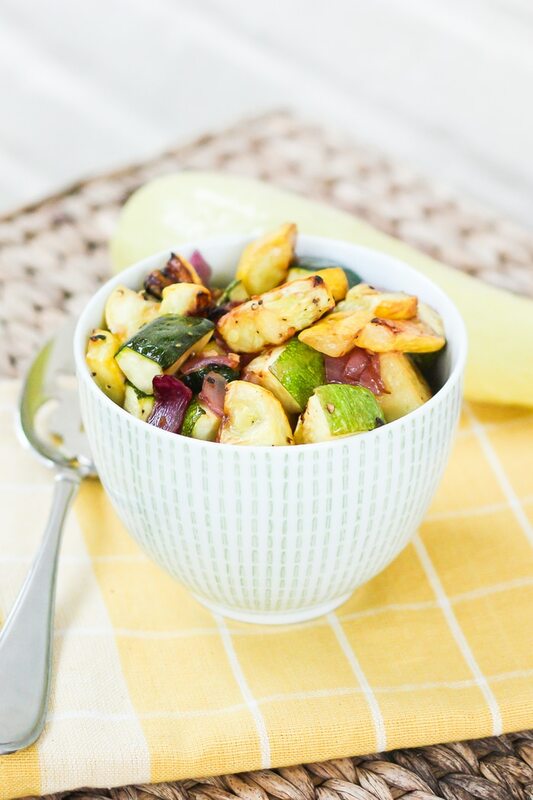 Can’t get enough of summer squash – and roasted veggies are always the best! Loooove summer squash lately.. good luck on your fit test!! 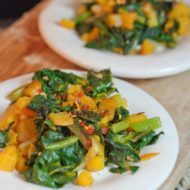 I love these summer vegetables and eat them all the time! This is a great dish! Roasting veggies is my favorite! I need to start doing it again because these look awesome! I have zucchini out the wazoo right now from my garden and this is the perfect recipe to use some of it up when I get sick of zucchini bread! 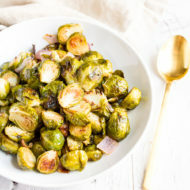 WEll, I wanted to try something different with this recipe than just placing the roasted veggies over a grain or pasta. I did a Wrap, with wasabi mayo (vegan) and some spices…it was AWESOME! Looks great! And what a fun way to boost up your daily fiber intake just a smidge. Yum! This looks like the perfect side!!! I get pretty bored off my plain veggies – this is a great idea! YUM! THanks for the great suggestion, mmmm! Prepping some for lunch wraps and sides!! I found your blog through TIU girls and have been LOVING all of your recipes and workouts!! Thanks so much for the inspiration to live a healthy Vegan/Vegetarian lifestyle and lose weight…12 month count down until my wedding! I tried this last night for dinner and it was amazing!! 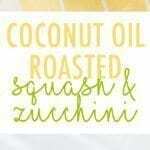 I have never roasted with coconut oil before but I will definitely be doing it again:) thanks for the amazing recipe!! I just made this dish. I added a bit of turmeric, and WOW! was it ever amazing. Thanks!